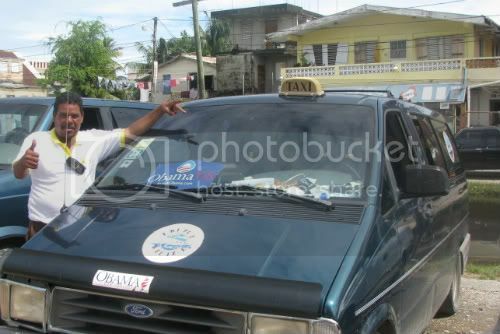 Taxi driver outside Belize bus station gives us the "thumbs up." While in Belize a few weeks ago, the Obama fever was evident across this Central American country. Since Belize's economy heavily depends on American tourists and the Belizean dollar is tied 2-1 to the US dollar, it is no wonder people there also craved a change. We talked to several locals before the election who were as emotionally invested as any American. Though it is unclear how much Obama's victory will actually affect US-Central American ties, people there are keeping hope alive. 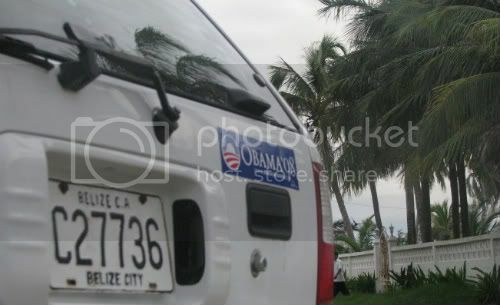 Another Belizean Obama supporter shows their love for our new president-elect! With access to American cable channels, Belizeans were not only able to follow every step of the election, but also see the viciousness of all the TV campaign commercials (thankfully, those of us in Mexico were spared of that). But this long campaign season also brought us some joy and entertainment. Around the world musicians composed Obama-tribute songs ranging from hip-hop to reggae. Though Belizean artists also have their own versions, here's a cool Obama reggae song from Belize's Caribbean neighbors, Jamaica. Artist Cocoa Tea released this song back in March 2008.